Let’s make it four in a row. Spirits with something close to meat. We certainly don’t mean to imply that there is anything wrong with this color; it’s been used for centuries and is an alternative to synthetics. This 1999 Campari approval shows the carmine on the back label. This 2007 Smirnoff approval also shows carmine on the back label. FDA has recently called for clear disclosure of this color. Filed Under: alcohol beverages generally Tagged With: ingredients, would you drink it? 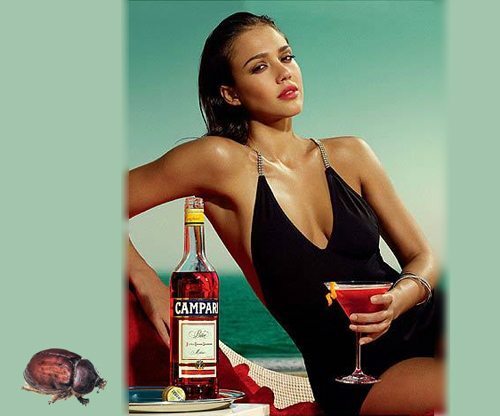 In line with the update above, here is the 2006 label approval for Campari, showing no reference to carmine or cochineal. If you’re going to write about this topic you might at least get the right insect that produces cochineal. It is not a beetle and certainly not the scarab beetle in your photo. Cochineal is produced by a small, fluffy white scale insect, which looks nothing like this.